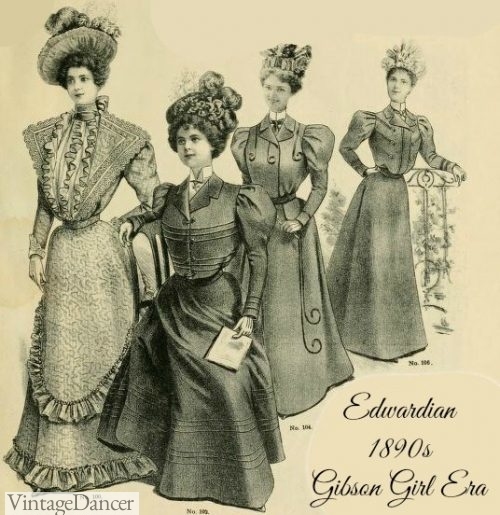 The 1890s through 1905 is part of the Edwardian era, otherwise known as the Gibson Girl era. This was the time for the two piece skirt and blouse set to emerge with style. Dana Gibson created the iconic Gibson Girl look with extra wide puffy tops and blouses paired with a curved corseted waist, a-line skirts, voluminous Gibson hair topped with a large flower and feather hats. This look lasted 25 years but gradually slimmed down to a more manageable fashion. Thanks to special clothing for bicycle riding, hiking and and horseback riding, women’s clothes were a bit shorter, freer and more comfortable than the preceding Victorian years. Men’s style was still formal from the Victorian era but ever so slightly getting more relaxed. Men will want to read my article on Edwardian Men’s Suits to put their evening outfit together. Ladies read on to learn about the late Victorin to Edwardian era fashion history, links to ready-made clothing/costumes and links to patterns to sew your own. The change of style that set the dress of the 1890s apart from that of the 1880s was a change of emphasis from the skirt to the bodice. The skirt that, with its complexity of drapery, had been the main feature of dress between 1875 and 1889, now became “scanty and unimportant” in the words of a journal of 1890. 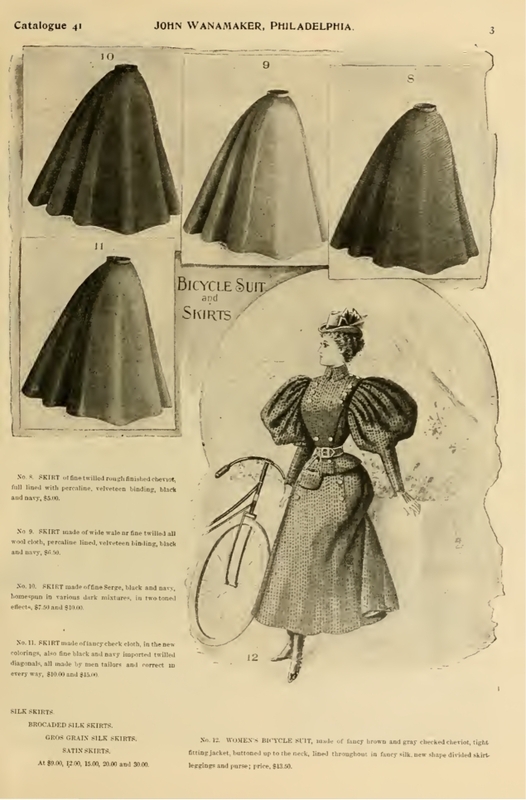 From 1886, skirts became less and less trimmed, their drapery fell in plainer lines, but, except in the severer tailor-made dress for country and active wear, the double form of skirt with a draped tunic or overskirt remained until 1889. In the 1890s, this form disappeared from day dresses during the first years of the new decade, and from more formal and elaborate dresses a year or two later. The skirt now fitted closely at the waist; fullness all fell from the center back, unsupported by any bustle or steels, plain and untrimmed, in a flowing line to the ground. It was this new line of the skirt which was the important change of the 1890s, although it was the bodice which now received fashionable attention. The waistline in 1890 was low and there was an emphasis on vertical lines throughout the dress. The revers of the jacket bodices, which were much worn, were often long and narrow, and the bodice trimming formed a close, deep V-shape on the front. By 1893, the revers of this type of bodice were becoming larger and, as the sleeves spread out widely, the revers spread towards the shoulder. On evening dress, revers spread as epaulettes over short full sleeves; or a deep berth of lace spread over them. In 1893, there was a full sleeve which sometimes fell off the top of the arm, so that it continued the line of the bodice across the arm; the bodice was held over the shoulder by narrow shoulder straps. All possible width and ornament were given to the upper half of the bodice to emphasize a small waist beneath. A yoked bodice had already appeared in 1890, and yoke shapes, square, round or V-shaped appeared on many dresses of the 1890s. The yoke was usually a trimming only, not a construction, and it was often frilled. The tight fitting bodice was usual, but many bodices were made with a loose section at the center front over a closely fitted lining, especially towards the end of the decade. Almost all the fullness and looseness which appeared in the bodices of the 1890s was deceptive. The full sleeves of day dresses were made on a lining which fitted the arm. The loose bolero and open jacket forms were often not what they seemed, but an applied trimming of a bodice on a close-fitting boned lining. By 1897, a bolero, or bolero effect, “appears on nearly every dress, either for morning or evening wear, and in every variety of material from velvet to lace, and this continued to the end of the century. There was one form of bodice in particular which developed and flourished in the 1890s. This was the blouse. A loose informal bodice, worn with a contrasting skirt, with or without coat or cape, had appeared as far back as the 1860s. A loose belted tunic had been worn in the 1880s, but by 1890 a blouse was more than the occasional garment of informal wear. It appeared on most evening dresses between 1892 and 1897. In 1897, the fullness left the sleeves in the same way as it began, with a small puff still remaining at the shoulder; but this puff, in part, lost its original difference from the bodice, and many blouses of the 1890s were as rigidly boned as any of the dress bodices. “Blouses have grown so much in popular favour during the last few years that from niglige garments of the loosest, baggiest and most unpretentious description they have developed into the favourite bodices of the age, making an appearance on the most important occasions … so much caught down and pleated and pressed into shape upon a close fitting lining that their leading characteristics have almost disappeared” (Woman’s World, 1890). The blouse was worn with a contrasting skirt. It could be worn with any skirt, and a single skirt could have its appearance renewed by the wearing of different blouses. The blouses varied from the plainest shirt-like garments to elaborate constructions and trimmings of silk and lace. The fashion persisted throughout the 1890s. The popularity of the blouse meant a change in the component parts of the tailor-made costume. The early tailor-made costumes of the 1890s were either dresses, the bodice worn with a waistcoat or having a waistcoat front, or they were dresses with matching jackets. “Tailor-made dresses of tweed, cloth, etc., are as a rule very simple in style to be suitable for travelling and walking, but like nearly all other gowns they have waistcoats which are often of bright colours” (Sylvia’s Home Journal, 1885). It was not until the 1890s that the form of coat, skirt and blouse was established, a form which has never since been absent from the dress of Englishwomen. The wearing of this form of dress increased during the 1890s: “This we have at least the grace to encourage from year to year . . . the coat and skirt worn with shirt and blouse. This appears this season in larger variety than ever” (Queen, 1893). The bodices of evening dresses usually fastened at the back but sometimes in the front. Those of the day dresses usually fastened in front, the fastening often being on the bodice lining with the bodice front overlapping. Some have a cross-over draping. They were usually boned, with five bones at the back, a bone at each side seam and two each side of the front opening. But, unlike the bodices of the 1880s, they were, by the mid- 1890s, very often without a center back seam. The high collar often had a stiff interlining, but in the last years of the century it often appeared as folded bands of material. The belt or waistband might also show this folded form. 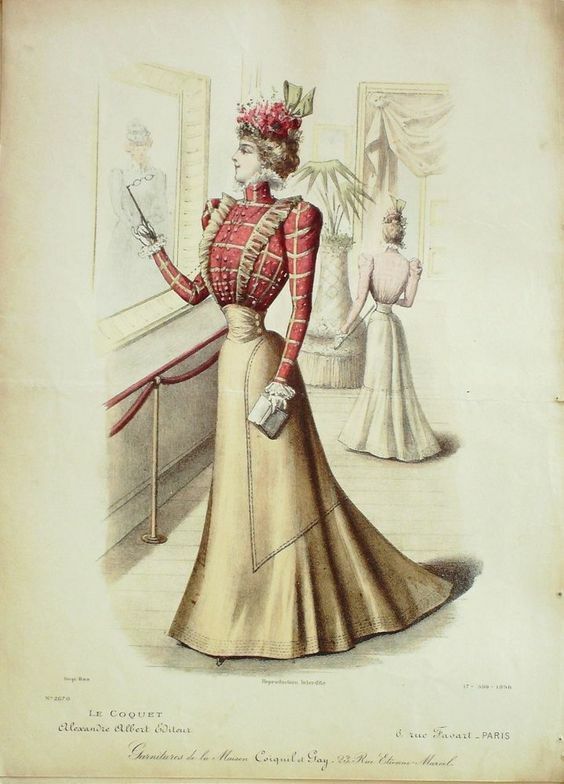 Belts, with the wearing of blouses and skirts, the short bolero jackets, and the emphasis on a small, neat waist, became a more important accessory in the 1890s than they had been since the 1870s (Plate 40). Buckles were used ornamentally and there was a revival of the buckle forms of the eighteenth century and the use of surviving eighteenth-century buckles. The tea-gown continued in use for the whole of the 1890s. As in the 1880s, it differed little from the most elaborate dresses, except in the looser lines of the bodice and a tendency to keep the front-fastening princess form. Many of the tea-gowns of the 1890s were in the “Empire” style, falling loosely from a high waistline, inspired by the fashions of the early nineteenth century. This style was sometimes used for evening dress. Read more about Victorian Tea dresses. As the sleeves spread and gave width to the bodice from 1892, the skirt widened at the hem. The fullness was still swept to the center back, but, by 1893, five and a half yards was often given as the usual width for the skirt at the hem. For day wear, the skirt still cleared the ground, until 1898. “Happily they continue short—a blessing for which we have to thank the bicycle.” But from 1898 they became longer and had to be held up in walking. Trained gowns for carriage wear were already fashionable in 1897. The plain line of the skirt now began to disappear in trimming. In the lighter materials, particularly, skirts trimmed with tucks round the skirt from waist to hem, or with apron trimming continuing as a flounce at the hem, were general by 1897. “The trimmed skirt now holds the field entirely in all dresses of this light description” (Lady’s Realm, 1898). The shaping of the skirt of the 1890s was achieved by gored cutting and by fitting over the hips with short darts. The number of gores in the skirt varied; double-width material was used, cut on the cross in fewer sections, but the narrower materials were cut in four or five gores at each side of the front width. But, the skirt of the 1890s was given its characteristic shape, until the last two or three years of the century, mainly by the cutting of the back breadths on the cross and joining them with a seam at center back on the cross cut. This flow at the back of the skirt was modified by the addition of secondary gores or wings in the seams in the lower part of the skirt, so that the fullness spread round the hem. This appeared as early as 1893; but, it did not change the skirt line noticeably until 1897, when the fullness was lessened in the upper part of the skirt, which fitted closely over the hips, leaving the still full lower half in a flounced line at the hem. A new type of skirt which had a full circular flounce below the knee also gave the same change of line from 1897. Skirts pleated from the waist were also worn at this time, particularly for dancing. “New fan-pleated or ‘sun-ray’ skirts, nine yards at hem, one yard at top” were noted by the fashions of February 1897. Once more the skirts were lined, often with a silk lining, and as they became fuller they were often made with stiffened interlining as well. Dresses now had to please the ear as well as the eye. “One of the ambitions of dress just now is the rustle. The frou-frou of a gown is one of its desired merits” (Queen, 1893). The silk of the lining changed from the rustling glace or taffeta to softer silk in 1898. “All our dresses will be mounted on the softest of linings, for to rustle we have now no desire” (Lady’s Realm, 1898-9). A new style was beginning to evolve in the last three years of the century. The change in line was slight but significant. The changing construction of the skirt caused it to fall in more curving lines at the hem and to fit more slimly over the hips. The bodice had lost its fullness of sleeve. In its plainer forms, the dress of these years may appear as a simple style; but in fashionable wear, the apparent simplicity was so overlaid with trimmings and veiled by its materials that the dress took a new character from them in reaction from the severe tailored style of the early 1890s. There was also a change in the use of materials. Until the late 1890s, the heavier cloths —satins, richly-figured silks and stiff glace silks —were worn, stiffly lined. In the last years of the century, it was the soft, clinging materials that were chiefly used. “All clinging materials will be used and even cloth will be of a soft texture” (Lady’s Realm, 1898-9). Velvet was fashionable and the soft, lustrous silk crepe, crepe-de-chine. The light open materials in silk, cotton and wool were even more characteristic. In woolen fabrics, “De laine, the old mousseline —that is a thin texture of muslin, made with wool—is again seen, printed or plain” (Ladies’ Treasury, 1894), and was a favorite material, as is seen in many surviving dresses. Muslin itself, also plain or printed, was much used. Silk gauzes and muslins were fashionable, particularly chiffon, a fine silk muslin. This material was being used for evening dress in 1890, and it became more and more fashionable, particularly for trimmings. “Everything is veiled or trimmed with chiffon, jewelled net, the flimsiest of gauzes” (Lady’s Realm, 1898). It was used for the flimsy scarfs which were folded twice round the neck and tied in a bow or knot in front, and for frills everywhere. With these light materials, a good deal of lace was also used. In the early 1890s, it appeared chiefly in deep berthes or epaulettes, or in deep flounces falling from short puffed sleeves, but in the late 1890s it was much used as part of the fabric of the dress. All types of lace were used, and old lace was brought out again for another wearing on dresses and blouses of these years. “We are to use a good deal of lace, old lace and new, but the new is made to simulate the old as much as possible” (Queen, 1893). Lace blouses were particularly popular: “It is essential to the conduct of all good wardrobes that they possess a lace bodice, if not two, the one high, the other low” (Gentlewoman, 1897). Tucks, very fine tucks round the skirt and bodice, were a particularly characteristic trimming of these years. On the tailor-made cloth dresses and coats and skirts, braiding of all kinds and applique of velvet were the usual trimming, and embroidery also ornamented all materials from cloth to net. Pattern shared the general softening of outline. The warpprinted chine silks were fashionable. Floral patterns in trailing lines, and floral forms loose in outline, appeared in the printed fabrics. “The plainest dresses will have floral designs trailing over them” (Lady’s Realm, 1898). Rarely were pattern and ground of woven fabrics sharply defined; and all might be veiled by lace, net or chiffon. Color, too, became paler, except for the strong contrast of black and white, which was fashionable for most of the 1890s. At the beginning of the 1890s, yellow had been a fashionable color, and all shades of purple. The bright contrasts of the 1880s continued in the early 1890s, but gradually faded into paler tones. The mingling of mauve and light green, ‘heliotrope and chartreuse’, was particularly characteristic for most of the decade. The change which marks the end of the Victorian period in women’s dress came in the year of the Diamond Jubilee, not with the end of the century or the death of the Queen. The fashions of the last years of the century were the beginnings of a new form which did not reach its climax until the next reign and the next century. White walking suit and hat. Lovely! Edwardian tea dresses – All about the popular white dress worn for tea and garden parties. 1919 Fashions – Inspired by TV series Mr. Selfridge here are some examples of clothing from 1919. Edwardian inspired dresses- Modern dresses that give a nod to the late Edwardian formal gowns. – Dresses, blouses, skirts, capes, suits, etc. – Quality patterns. Mostly skirts and two corsets so far. Dresses, walking suits, blouses, skirts, aprons, and girls clothing. European stockist of patterns. Many of the best Edwardian era patterns are here. – Mostly late Edwardian skirts, blouses, suit in printed or digital downloads. Edwardian shoes came in lace up or button up “granny boots”, some with contrasting white or tan spat tops as well as shoes. For evening basic pumps made of silk were embroidered or beaded. Day time shoes featured the low heel walking Oxford or mary jane. Read more about Edwardian shoes styles. Shop Victorian boots and shoes or Edwardian boots and shoes. History of the late Edwardian large picture hats. Read my quick guide to turning a skirt and blouse into an late Victorian/ Edwardian costume. Read this guide to create a Titanic era dress from thrifted clothing would also be useful, especially the 3rd class costumes. Наша организация предлагает Тестабол Пропианат купить в любом городе.